My idea of a dream home includes, necessarily and without question, a large front porch. I also envision lilacs and tulips, bougainvillea or ivy or sweet peas climbing up the railings and columns, wide front steps, hanging flower baskets, a wind chime, a porch swing and rocker and, of course, a large braided rug. Somehow the braided rug says in my mind 'welcome, come on in' like nothing else can. It's equal parts traditional and cozy and down-to-earth (and can also be frugal). But it works other places than the front porch. It can instantly add a splash of color and warmth to a nursery, a bathroom, a bedroom or a reading nook. But I've been perplexed for some time - how to find the perfect one? Well forget the drudgery of searching top to bottom, the frustration of endless options and decision-making (and all the dark colors most rugs come in); I'm going to make my own. 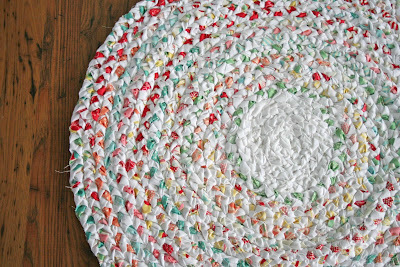 I just found this tutorial for a braided rag rug today at Moda Bakeshop. (okay, I found it yesterday, but as our internet connection has been temperamental in the extreme, you'll forgive my indiscretion). Excellent. Excellent photos, instructions, and final product. And ee-zee. (I'm really into easy) Now all I have to do is get my hands on a Honey Bun and I'm off! I think I'll make one for Reagan's room - in blues and browns. Ok that's it; I'm sold. 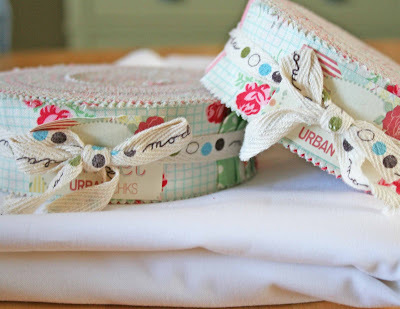 I love the Moda Bakeshop and Moda fabrics in general, but really, with a product line full of names like Jelly Roll, Cake Layer, Honey Bun, Turnover and Dessert Roll, what's not to love? So check out the bakeshop, decide on a recipe and get cookin'. Yield: tons of fun in great colors and projects. Enjoy!